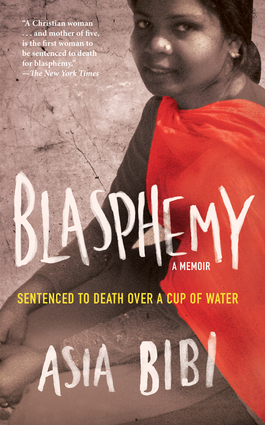 Blasphemy: A Memoir, Sentenced to Death over a Cup of Water was published by Chicago Review Press in 2013. It is the story of Assiya Noreen, often known in the media as Asia Bibi. The book’s title offers the most reasonable and direct introduction to the book’s matter. So let us be more circumspect in our approach. Whoever you are and wherever you might be, is it possible that you are not universally appreciated by your community? Is there something about you that others might not like? Do you dress, act or perhaps think differently in some way that might cause alienation? Have you ever spoken or written a stray word or phrase that irritated others? How might you feel about finding yourself in prison – any prison, anywhere – based on just such issues? In 2009 Asia Bibi was not only in a Pakistani prison, she had also be sentenced to death. She secretly passed her story through intermediaries to Anne-Isabelle Tollet. It’s a small book but it’s an enormous story. Too much story to try to convey it well in a brief article such as this. As a website focussed on the interests of the average person’s experience of freedom of expression, we hope we can be forgiven for being underwhelmed with Mr. Trudeau. Delicate domestic context? Oh, my. Such a delicate grasp of human rights this national leaders seems to have. Asia Bibi, an agricultural worker who picked berries to help her family get by, was imprisoned and sentenced to death over a cup of water. This is not “delicate“. This is brutal. This is violent. This is desperate. This is an outrage. In June 2009 a Pakistani mother of five, Asia Bibi, was out picking fruit in the fields. At midday she went to the nearest well, picked up a cup, and took a drink of cool water, and then offered it to another woman. Suddenly, one of her fellow workers cried out that the water belonged to Muslim women and that Bibi—who is Christian—had contaminated it. “Blasphemy!” someone shouted, a crime punishable by death in Pakistan. In that instant, with one word, Bibi’s fate was sealed. First attacked by a mob, Bibi was then thrown into prison and sentenced to be hanged. Since that day, Asia Bibi has been held in appalling conditions, her family members have had to flee their village under threat from vengeful extremists, and the two brave public figures who came to Bibi’s defense—the Muslim governor of the Punjab and Pakistan’s Christian Minister for Minorities—have been brutally murdered. In Blasphemy, Asia Bibi, who has become a symbol for everyone concerned with ending an unjust law that allows people to settle personal scores and that kills Christians and Muslims alike indiscriminately, bravely tells her shocking and inspiring story and makes a last cry for help from her prison cell. Proceeds from the sale of this book support Asia Bibi’s family, which has been forced into hiding. Though this post is ostensibly a book review – it is also an article of news, a reminder of the purpose of this website and a call to action. Write letters to your MP, the Prime Minister and the Minister of Global Affairs seeking something more than an appreciation of the delicate environment of global politics. Perhaps, also, look to what can be done to shore up protections of freedom of expression. After all, is it possible that you may have spoken a word or taken an action that set you apart or offended some others? Asia Bibi, but for the grace of secular human rights law, could be you.